Criminals were blasted for making “heinous” hoax calls to the emergency services yesterday after RNLI crews endangered their lives dealing with a false alarm over the weekend. 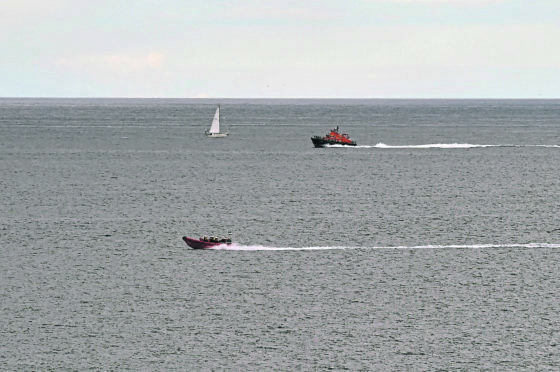 Macduff and Buckie lifeboats were scrambled at 4pm on Sunday after Aberdeen coastguards received a radio call for help. The Banff coastguard crew also joined the search which lasted two hours until the incident was established as a hoax. Banff and district councillor Glen Reynolds has now called for the public to be educated about the consequences of malicious calls. He said: “Whilst recognising that many people that make these calls may have mental health issues, there clearly needs to be better education in place in order that the full and potentially horrendous consequences of such madness are appreciated. “People who are responsible for fake emergency calls can and should be classified in the same way as those who harass others by repeatedly making false, grossly offensive, obscene or menacing telephone calls. His fellow Banff councillor John Cox added: “I’m lost for words and really don’t understand the mentality of it. This is thought to be the ninth hoax call made to Aberdeen Coastguard this year. Troup councillor Ross Cassie labelled the caller’s actions as “foolish”. He said: “Whilst everyone is chasing around looking for the hoax, real emergencies could be going unanswered. And councillor Mark Findlater said: “It takes the voluntary professionals who go out and risk their own lives for our safety, into potentially dangerous conditions for no reason. A spokesman for the coastguard said: “There were two lifeboats sent out in response to a cry for help over the radio. “Buckie and Macduff lifeboats went out after the call came in just before 4pm. “Banff coastguard and rescue team members were also out searching the shore.